1canoe2 operates out of an old barn in rural Missouri, on the farm where Carrie Shyrock grew up. Though she’s lived and traveled elsewhere, it’s the landscape she grew up in that provides inspiration for the designs she creates for the company she started with friend Beth Snyder. The happy crew of 1canoe2. At left are business partners Karen Shyrock and Carrie Shyrock. Partner Beth Snyder is fourth from the left. That love of nature right outside her window will be shared with fabric lovers in October, when 1canoe2’s first line of Moda fabrics, Tucker Prairie, hits the stores. 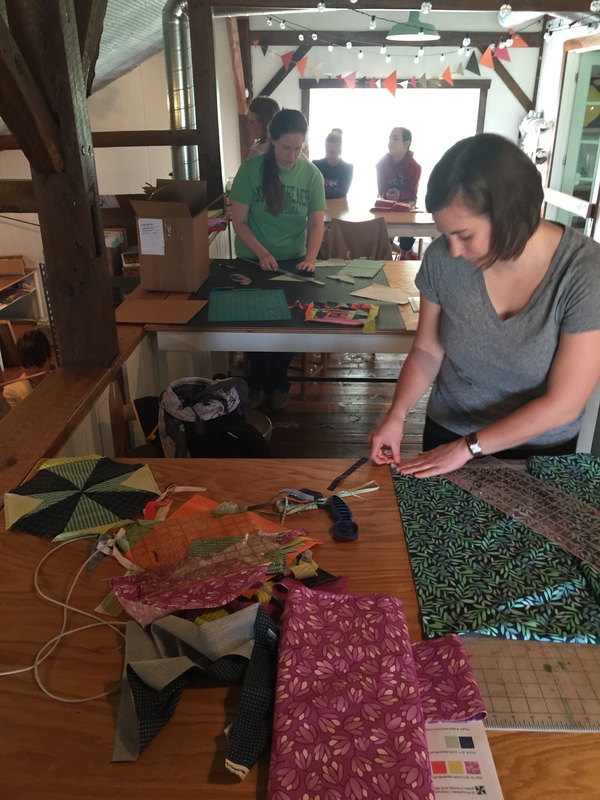 Beth is especially excited by the opportunity to create fabric. 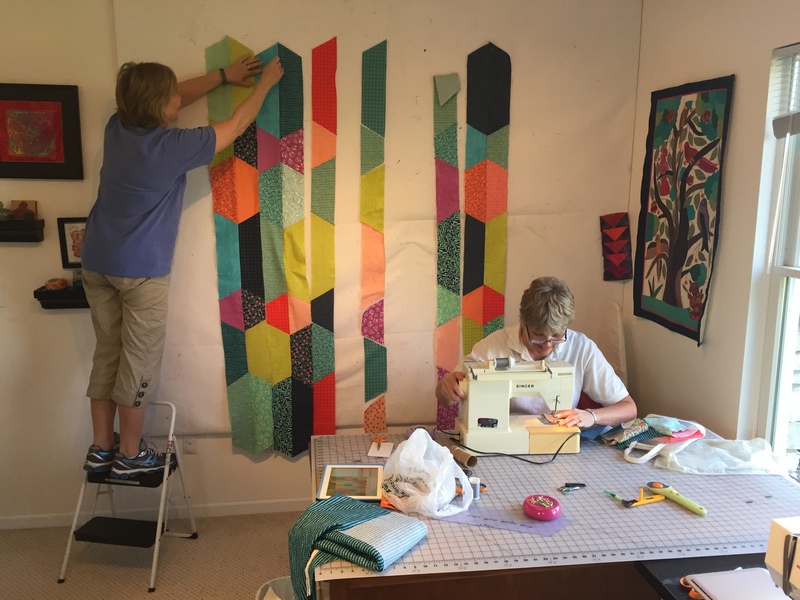 “I majored in graphic design and fiber in college, so fabric design is something I’ve always wanted to do,” she says. Beth and Carrie went to high school together and college too—at the University of Missouri in Columbia—and both studied and enjoyed art. After college, Beth was working as a graphic designer and living in Nashville when her husband-to-be bought her a small letterpress on Ebay so she could print her wedding invitations. “I just love touching ink, changing colors, and getting dirty,” says Beth. Carrie contributed some drawings to the process and after they wedding they continued to work together long distance. Beth moved back to Missouri in 2008 and she and Carrie opened an Etsy shop, selling wooden recipe boxes made by Beth’s father, filled with the recipe cards they’d designed. Since they’d enjoyed canoe trips together on Missouri’s clear, spring-fed rivers, they decided to name their shop 1canoe2, which Beth says is shorthand for one canoe, two girls. “But I didn’t really think it through, because I’m always having to tell people ‘It’s the number one, the word canoe, and the number two,’” she says with a laugh. 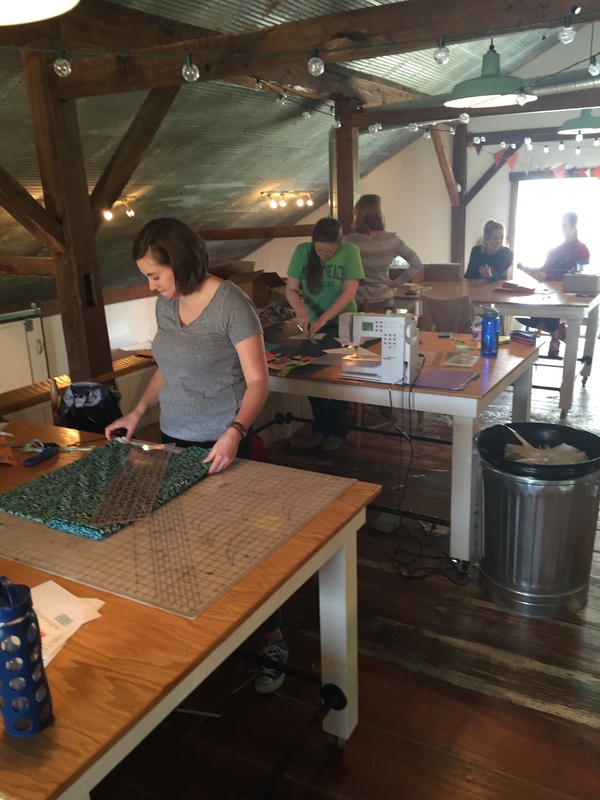 In the loft of the renovated barn, where Carrie’s dad used to store lumber, 1canoe2 staffers prep samples for Quilt Market. Another view of sample-making in the loft. The open, light-filled spaces work well for the 1canoe2 team. 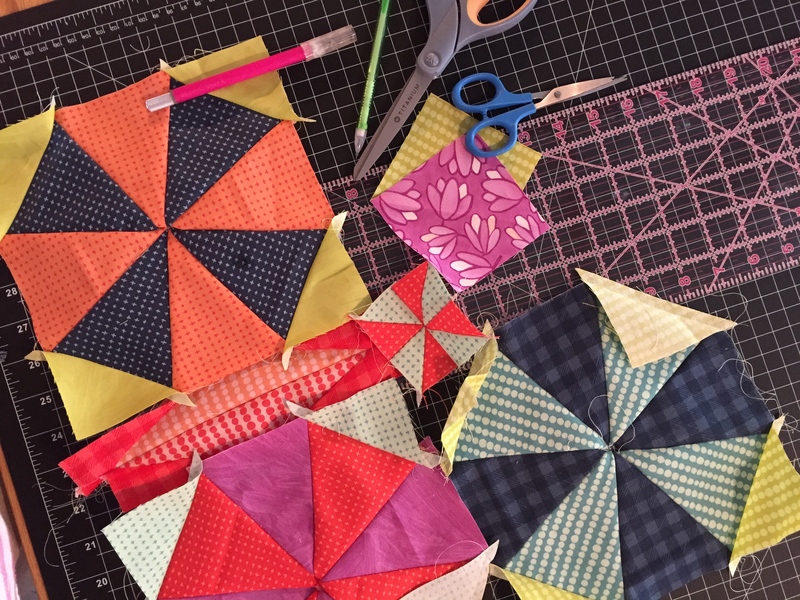 Friends and relatives gathered this week to prep samples for spring Quilt Market. Beth’s mom is on the step stool. Her aunts also helped out. 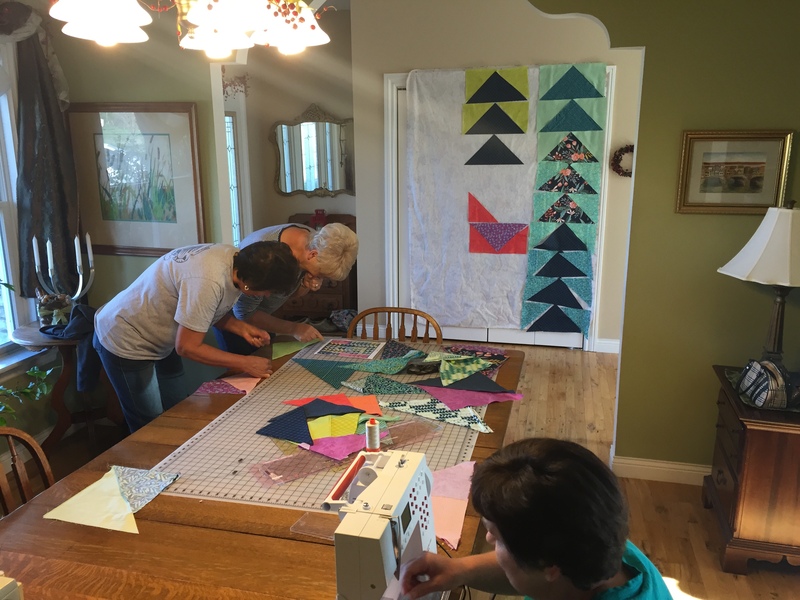 Carrie and Beth are preparing for Quilt Market: Beth’s mom, aunts, and family friends pitched in to make samples this week, and 1canoe2 employees did the same. In the photo of staff in the loft, it’s easy to see the barn has changed significantly since the days when Carrie’s great-grandfather raised mules and when her dad stored lumber here. Concrete’s replaced dirt floors and insulation keeps it warm in winter. “It’s a bright, open space that’s perfect for what we’re doing now,” says Carrie. 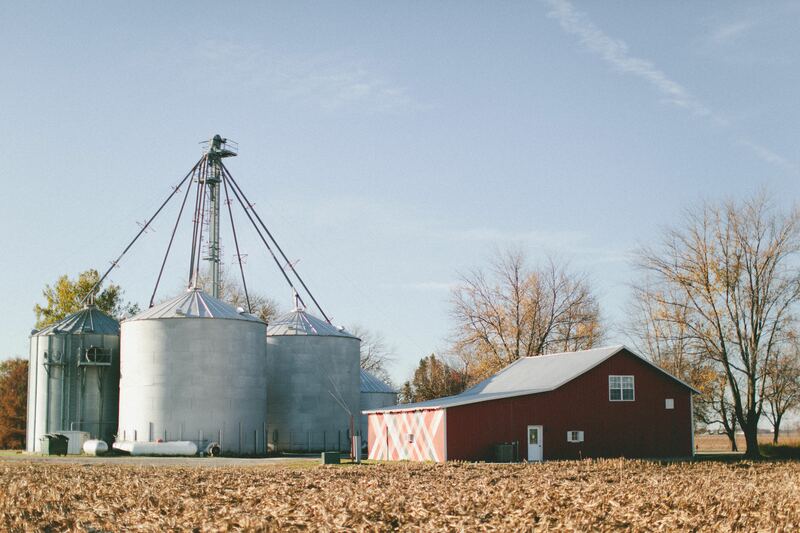 Outside the barn Carrie’s family still grows corn and soybeans in the wide open fields that inspire 1canoe2. Inside, 1canoe2 raises an appreciation for color and fresh, vibrant design. “We feel so lucky we get to do this work,” says Beth. Being raised on a large farm I was always referred to as “The Country Girl” by the “town” students & sometimes it made me cry. I now know that I lived with such richness of spirit & soul that others have never gotten to experience. You ladies have made my TN. morning; Good Luck & please for me “Look out at The Fields Glowing with LIFE; your introduction epitomizes my love of COUNTRY. I don’t cry now at that moniker because I was so very lucky as are YOU. Congrats to Carrie, Karen and Beth. These ladies are neighbors and friends and I am so excited to see what comes out of the barn. 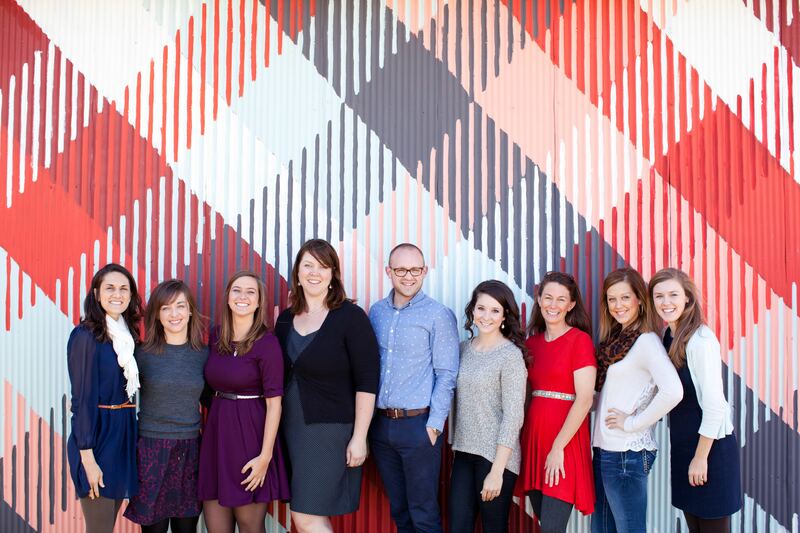 Can’t wait to order material from their line and make something special with it, possibly for our church auction! You girls are amazing. Been following them since before the beginning I think! And I have one of Dad’s handmade recipe boxes too. So fun to see the success hard work has brought them. Congratulations, Carrie, Beth and Karen. As a Missouri girl, I love this story.